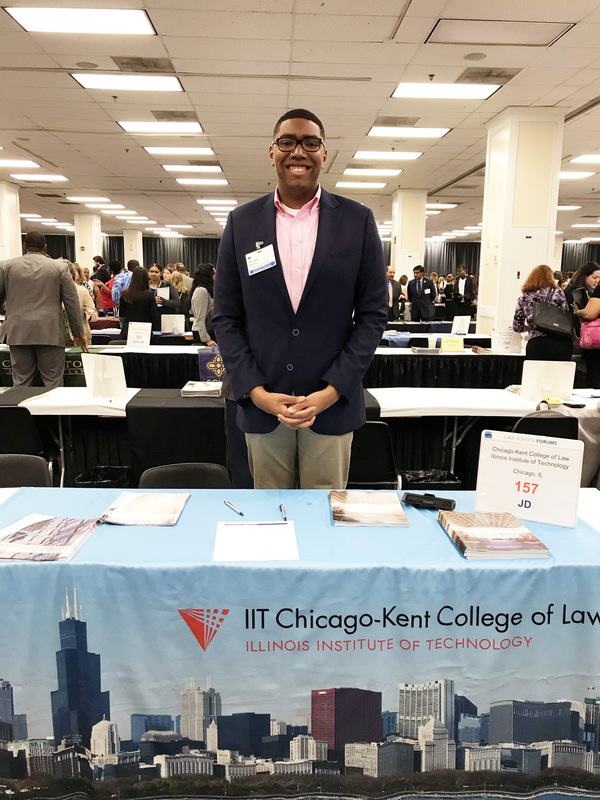 Michael McGee, Class of 2020, Answers Prospective Students Questions at the LSAC Law School Forum in Washington, D.C.
Second-year student Michael McGee represented Chicago-Kent at the July 2018 Law School Forum in Washington, D.C.
My name is Michael McGee, a rising 2L at Chicago-Kent College of Law. Originally, I am from Detroit and am a proud alumnus of Hampton University. 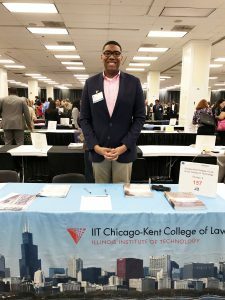 While at Chicago-Kent, I serve as Vice President of the Black Law Student Association, Class Representative for the Student Bar Association, and a member of Chicago-Kent’s Trial Advocacy Team. This past year, I have had the pleasure of serving as a Student Ambassador. This position allows me to participate in a variety of prospective and admitted student events, giving pre-law students an insight into being a law student as they pursue their dreams. On Saturday, July 21, 2018, I attended the Law School Admissions Council’s Law School Forum in Washington, D.C., on behalf of Chicago-Kent. Recap of LSAC Event in Washington, D.C. Attending the LSAC Law School Forum was an amazing opportunity. I truly enjoyed speaking with pre-law students about my journey to law school and assisting them in their pursuit. One of the most common questions many of the pre-law students had to do with what opportunities Chicago-Kent provides students for gaining hands-on experience in legal practice. Many students were interested in hearing more about the 1L Your Way Program. This program allows first-year law students, in their second semester, to participate along with upper level students as members of one or two clinic sections and students gain insight into a variety of legal practices. I was able to talk about the program from my own experience. Many of the students at the forum were primarily interested in the Criminal Law, Labor & Employment, and Intellectual Property legal clinics. Chicago-Kent’s legal writing program also contributes to the hands-on experience students receive. The design of the program allows students to work on assignments that reflect those they will see in actual practice, while learning about several substantive legal fields. Just this year, 1Ls completed assignments dealing with intentional infliction of emotional distress, Title VII, and the Fourth Amendment. If students are not sure about the type of legal practice they would like to pursue, then the legal writing program can prove even more beneficial in helping them decide. These qualities of the school truly prepare law students to one day be attorneys and were aspects many pre-law students at the forum showed interest in. A question that one student asked, and which I believe many more pre-law students should ask, is how Chicago-Kent supports its alumni. The Solo and Small Practice Incubator is a prime example, as the one-year program offers recent graduates the support they need to jumpstart their solo or small firm legal practices. This premier program shows the dedication Chicago-Kent has to its students even after graduation. Overall the forum was a great experience and a humbling opportunity to cultivate the passion of future young attorneys.